Unless you're a synesthete, the five senses are pretty straightforward—but designers keep on coming up with cool ways to mix-up the experience for those of us who don't have the natural ability. 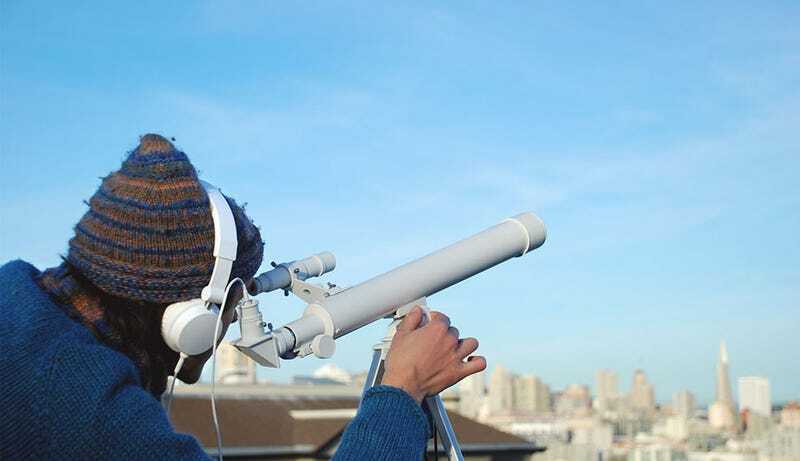 Which is what makes the Wassiliscope so neat: This thing transforms color frequencies into corresponding sound frequencies, allowing the user to hear what they see. Totally trippy. The project is by San Francisco-based Christopher Yamane of Fragile Studios, who wanted a way to unite the "materials"—aka waves—of sight and sound. An embedded camera analyzes the average light frequency in the viewfinder and gives it an audible match, which is then pumped into the headphones via a triangle wave oscillator. Lemons definitely sound different than trees that sound different than blue skies that sound different than white walls, and it's fun when the tinny notes change with the images. Fun, and a little disconcerting. Any synesthetes out there want to weigh in with their personal experiences?